March 2017: Staci was interviewed for PRI’s Living on Earth! Check it out! January 2017: Staci was asked to write an op-ed on the incoming administrations possible repercussions on environmental research. In typical Staci style, she brings light and hope to a daunting topic. 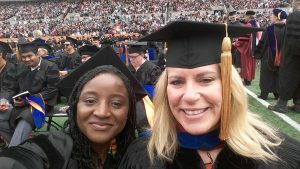 June 11, 2016: GRADUATION DAY FOR DR. LEAH CHIBWE!! 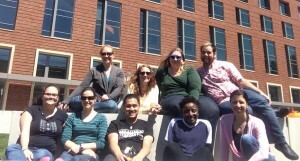 Celebrating the accomplishments of the latest PhD to come out of the Simonich lab! Great job Leah! Staci is an amazing mentor, even after you get the diploma! May 23, 2016: Detection of Pesticides in pond turtles getting attention! 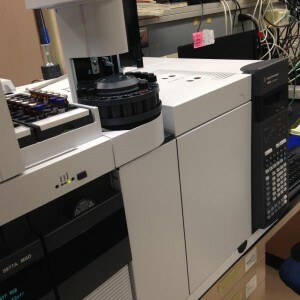 Work performed by Leah Chibwe, Jill Schrlau, and Staci, as part of a collaboration with University of California Davis, and the National Park Service helps identify persistent pesticide movement in the environment. May 6, 2016: Post Doc Cleo is off for a month long cruise of the North Atlantic to monitor the cycling of volatile organic compounds (VOCs) by plankton! Learn more here. While we will miss her presence in the lab, we can’t wait to follow her progress. Happy sailing Cleo, see you in June! April 27, 2016: Research performed by Ivan Titaley recen tly making headlines! by the Division of Environmental Chemistry. Staci Simonich (Project 5 leader)has been selected to be the recipient of the 2015 President’s Commission on the Status of Women University Mentoring and Professional Development Award. 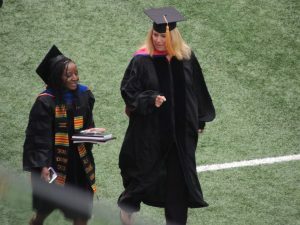 She also received an “Excellence in Graduate Mentoring Award” from the OSU Graduate School. Leah Chibwe (Project 5 Trainee) and Greta Frey (CEC Trainee) were awarded an Oregon Lottery Graduate Scholarship for the 2015-16 academic year. These scholarships are awarded based upon the academic merit and scholarly achievement of the nominees. Ivan Titaley (Project 5 Trainee) was selected by Dr. Dayle Smith as a sponsored fellow at the Pacific Northwest National Laboratory (PNNL) to get hands-on training in modeling of polycyclic aromatic hydrocarbons. To financially support Ivan on this unique training opportunity, he has been awarded an SRP Trainee Externship Award through the SRP Training Core. This activity provides important synergy between Project 5 and Core C – Biostatistics and Modeling. Leah Chibwe (Project 5 Trainee) has been selected as a winner of one of the 2015 Graduate Student Paper Awards. 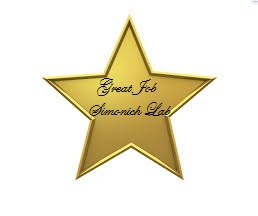 This is the highest award given to students by the Division of Environmental Chemistry of the American Chemical Society. Leah will present her paper (“Aerobic Bioremediation of PAH Contaminated Soil Results in Increased Toxicity and No Change in Excess Lifetime Cancer Risk”) this fall in Boston at the special C. Ellen Gonter Environmental Chemistry Awards Symposium. Leah Chibwe (Project 5 Trainee) received one of the 2015 Graduate Student Awards in Environmental Chemistry from the Division of Environmental Chemistry of the American Chemical Society.